The idea behind Jr. 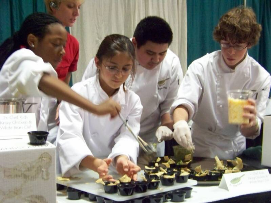 Chef Central is simple: teach kids, ages 10-15, how to cook! It started in the fall of 2006…Having been bombarded with news headlines about the state of health of America’s children, I struggled to connect the dots—why were kids, living in the food bowl of America, also fraught with obesity, diabetes, and other food related challenges, despite the abundance of seasonal fresh produce in California? they were breaking bread—no matter the company, place, or occasion. Reinforce the “circle-of-life” of food — from the farm, to the market, to the grocery store, to their plates – so kids become educated cooks and consumers. capable of accomplishing every task required; tell, demonstrate, assist, let go. kids can make at home using fresh, seasonal produce. program, as evidenced by these Jr. Chef Alumni testimonials. Interested in becoming a Jr. Chef Licensee or Affiliate? Details can be found here!